Congratulations to ISR Director Reza Ghodssi (ECE/ISR), who has been selected as a 2014-2015 Distinguished Scholar-Teacher by the University of Maryland. 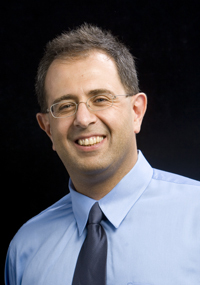 Ghodssi is the Herbert Rabin Distinguished Chair in Engineering. He joins Professor Min Wu (ECE/UMIACS), Professor Carol Espy-Wilson (ECE/ISR), 2012-2013; Professor Avis Cohen (Biology/ISR), 2011–2012; Professor K.J. Ray Liu (ECE) 2007–2008; Professor Michael Fu (Robert H. Smith School of Business/ISR), 2004-2005; Professor Steve Marcus (ECE/ISR), 2000-2001; and Professor Emeritus Thomas McAvoy (CheBE/BioE/ISR), 1997-1998; as ISR winners of the award. The Distinguished Scholar-Teacher program recognizes faculty members who have demonstrated outstanding scholarly achievement along with equally outstanding accomplishments as teachers. Nominees for the award are selected by their peers; the winners are chosen by a panel of former Distinguished Scholar-Teachers. Ghodssi is one of only a handful of faculty members so honored this year. The Scholar-Teachers bring a passion for learning to their colleagues and students, and serve as models of what a professor at a fine research university should be. Winners receive a cash award to support instructional and scholarly activities, and make a public presentation in the fall semester on a topic of scholarly interest.